I trying out the 2.5 EAP (build 96.1146). I've created a new Rails application by using the usual Rubymine option to create a Rails app which seemed to work ok and no errors were reported. The problem is that in the project tree view the context menu of the root node of the app is missing all the usual Rails options to create controllers, models etc. Rubymine is clearly aware that the project is a Rails app since the project tree view gives me the option of viewing the tree as a Rails structured tree, but it's just not giving me the Rails context menu options. Any idea if this is a known issue or if I've missed a setup step? 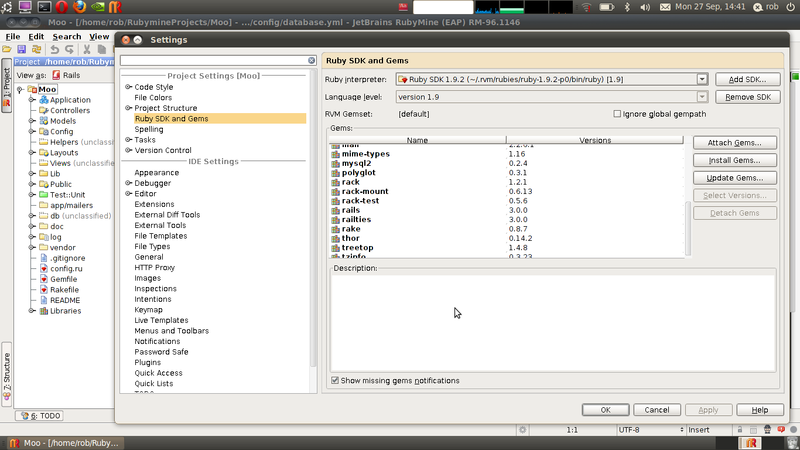 I'm using Ruby v1.9.2, Rails 3.0 and RVM. Do you have rails gem attached to your project? Yep. I've gotta confess that I'm still learning Rubymine and I might be doing something really stupid, however I've created a new Rails app using v2.0.2 and that immediately gave me the Rails context menu option without any further tweeking. 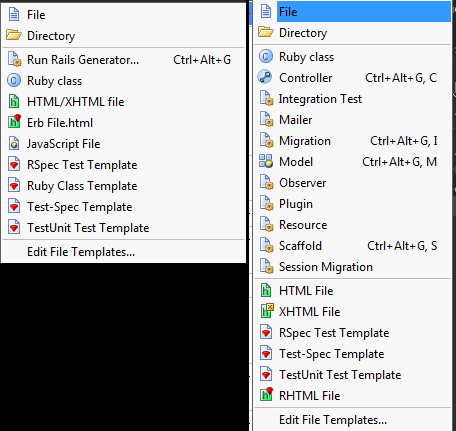 I've attached a couple of screen shots to show the Rails Gem and how my context menu appears. 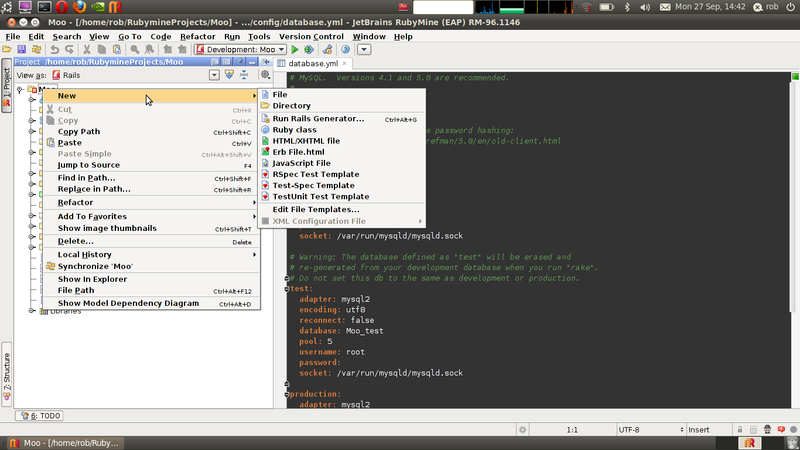 I've installed the EAP release on another Ubuntu 10.4 machine and get the same problem. Unfortunally, not yet. However I've asked responsible developer to handle this. Sorry to say that I've just tried RC 97-95 and I have exactly the same issue in that version too. All I did was launch v97-95 for the first time, create a Rails 3.0 and Ruby 1.9.2-p0 project, and bingo no context menu options to create new Models and Controllers etc. Note that on the same machine v2.0.2 is working fine. As I previously stated I'm using Ubuntu 10.4. I hope we can sort this out since right now RM 3 is useless to me. It looks the same for me on Windows 7. I just assumed someone wanted to fold all those options all up into "Run Rails Generator" to make the list shorter. I guess it would be nice if there was a preference menu to show or hide all the generators (maybe it's there - I never bothered to look). I'm fine with the way it is now myself.